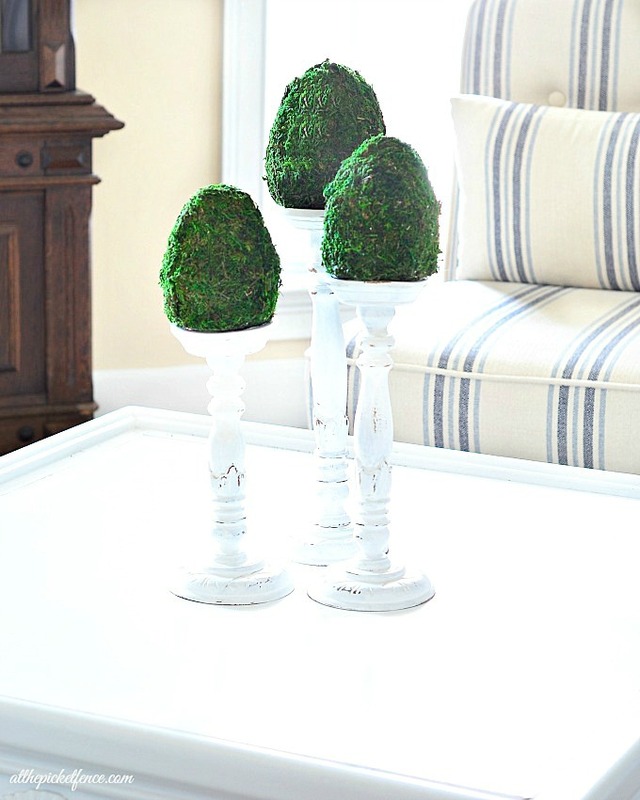 Repurposed Candlesticks with Moss Covered Easter Eggs! Choose your paint based on the type of finish you want. I used DecoArt Americana Decor Chalky Finish Paint. 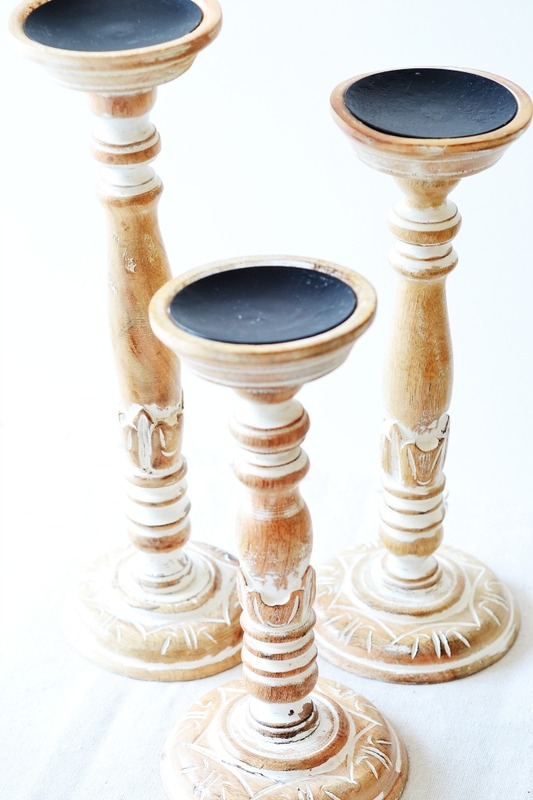 Paint your candlesticks with 1-2 coats depending on desired coverage. Allow to dry. Using a fine grained sanding block, give your candlesticks a light patina by removing some of the paint. 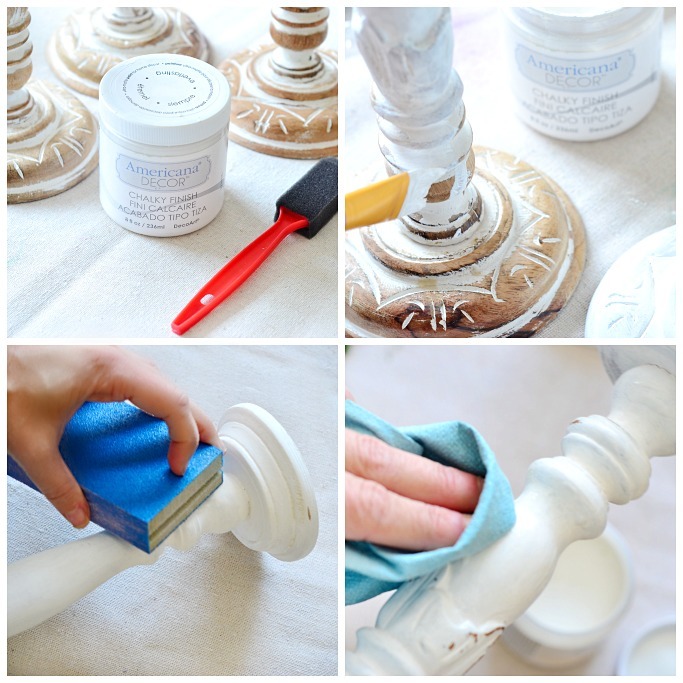 Clean off candlesticks and then apply a wax or polyacrylic finish if desired. 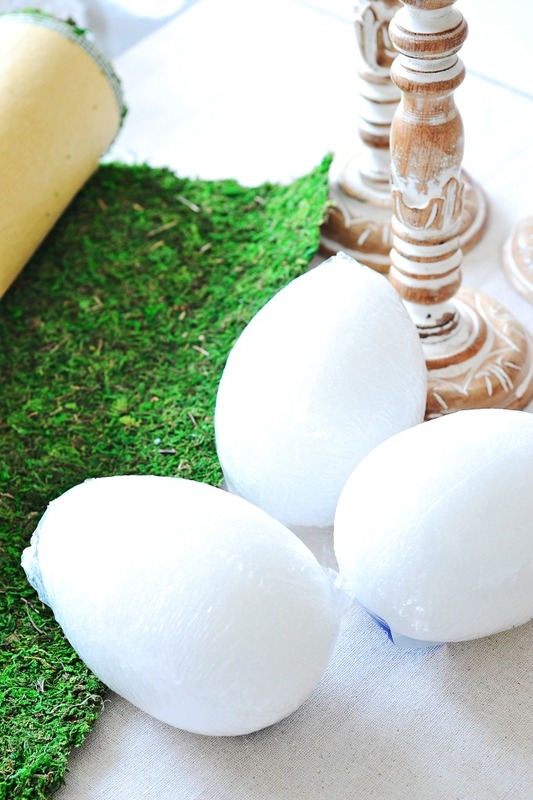 To create your moss eggs, with a serrated knife, trim off the bottom of the styrofoam eggs so they will sit on the candlesticks. 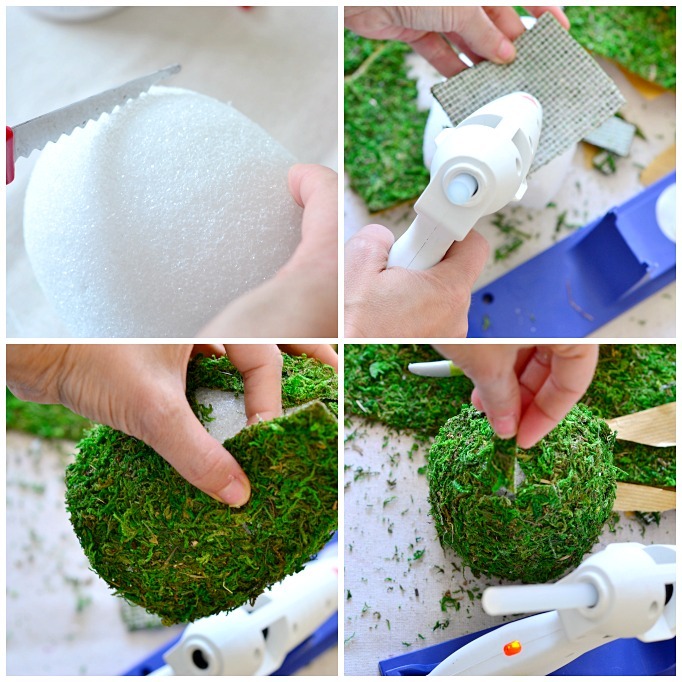 Cut your moss in small strips and using a low temp glue, glue moss to eggs. You will have some gaps between your strips of moss. Cut small pieces and hot glue to fill in the gaps. Are you curious to know what I sent? Well head over to visit my friend Stacy, of Not Just a Housewife, to get the full scoop! Hopefully she doesn’t hate me too much. grin! Here’s the full list of all 21 fabulous bloggers so you can see what each one did with their surprise thrift store find! PS…Be sure to enter my Americana Decor Chalky Finish Paint Giveaway, to win some of your own fabulous DecoArt products! 39 Comments on "Moss Covered Easter Eggs..and she sent me what?" Ladies I love them! The candle sticks are great of course but with the moss eggs on top… fantastic! This is a great series, I want to go look at all of them! What a fantastic and fun idea to mail each other Thrift Store finds! 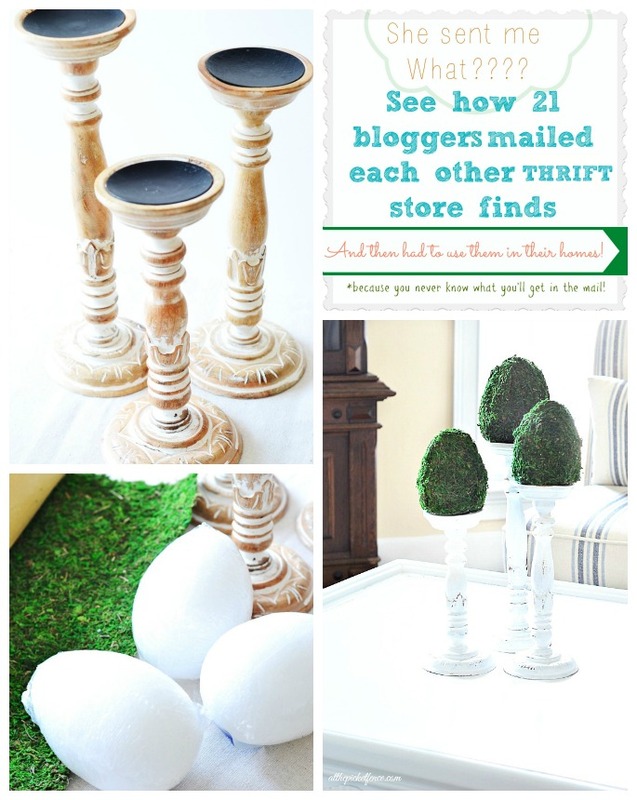 Love how you upcycled the candlesticks and the bright green moss covered eggs! Love this, Heather! You didn’t do too badly in what you received. I always love to find some nice wood candlesticks at the thrift store. 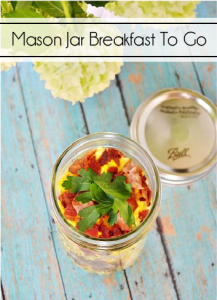 Love the moss eggs, too. I’m glad you mentioned the paint you used. I didn’t know they made that and it seems like the perfect paint for when you have projects of this size that you would like to use chalk paint on. What a fun day sweet friend -love it! umm -off to get another cup of coffee because I meant to say fun IDEA! But have a fun day too! I love how you used them! That green absolutely pops against the white like that. So cute girls~ love it!! Awesome Easter project!!! I love it for spring and Easter! thanks so much for joining on the party!!! Ahh!! LOVE these so much! 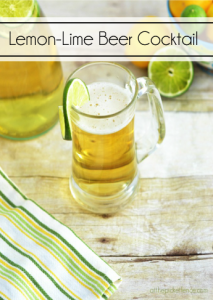 The perfect spring thing! These are adorable!!! Love a good candlestick and the eggs are perfect on top! 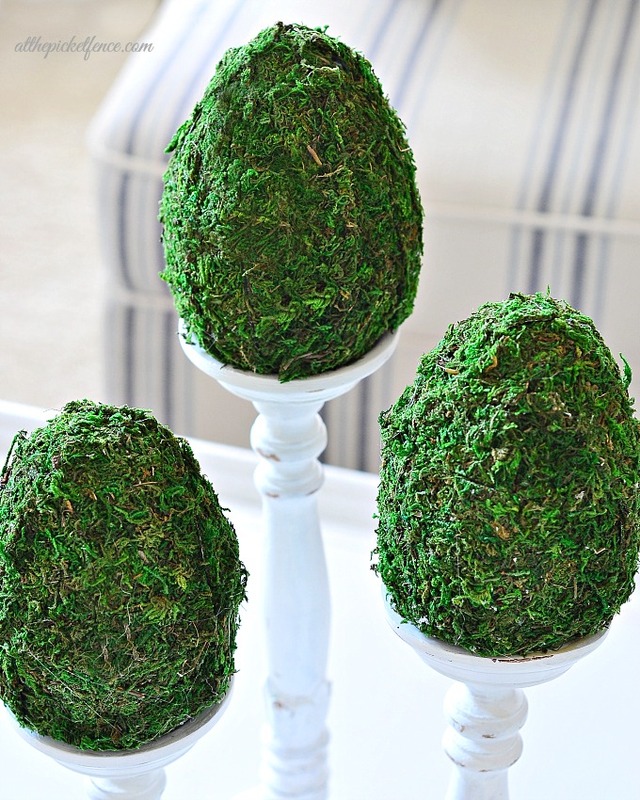 Now that is a great thrift store find!…and I actually liked them as they were too!….love your moss covered eggs!…Such a fun thing to do!!.. Holy cow, this is great! I think I’m going to copy – I have three candle holders I’ve been reluctant to let go of, and just bought three giant plastic eggs at dollar tree. Now I just need to run back for some moss. Love! 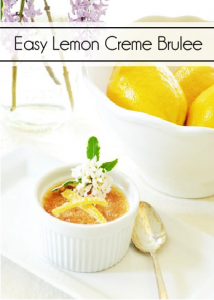 I adore your Easter eggs – and such fun little candle holders! That’s awesome! That is a really cute idea! One of my faves! oh my goodness I love how you brought those candle holders to life with the paint and especially love the way you rubbed patina (off) life into it! Where do you get the moss in sheets? Sometimes the simple pieces make the most special projects . . . like yours! Super cute candle sticks and love the little moss eggs 🙂 Adorable! These are so pretty! Just love the moss eggs perched on the pretty, pedestal candleholders. Sharing, for sure.